Are you all set to usher in the Year of the Pig with an aptly sumptuous meal? Well, if you’re still planning where to have your reunion dinner or deciding on the best yu sheng, Racines, Sofitel Singapore City Centre’s signature restaurant offering authentic Chinese and French fare, have options galore. Executive Chinese chef Andrew Chong and the team have worked tirelessly to elevate this year’s creations, starting with the auspicious yu sheng. What is traditionally prepared with julienned vegetables and fresh salmon slices is now boast a medley of pickled chayote, kohlrabi, celeriac, finger lime caviar and cured trout fillet, brought together with a generous shower of piquant black garlic dressing to complete this east-meets-west ensemble. If you're craving something more familiar, the Sofitel luxe yu sheng, studded with abalone, makes a grand comeback alongside the traditional yu sheng enlivened with house-cured trout. These are all available for takeaway or as part of the restaurant's set menus. The culinary team has certainly pulled out all the stops to create an extensive selection of auspicious offerings. Of course, it’s only fitting that the celebrations commence with an extravagant repast. And that’s exactly what you’ll get when you opt for the Premium Reunion menu (available for lunch and dinner from February 4 to 6) that includes a jaw-dropping selection of the finest ingredients showcased in a variety of lip-smacking dishes; think luxe abalone yu sheng; a treasure pot brimming with ocean gems such as sea cucumber, crab and fried scallops; and a meltingly tender caramelised black cod fillet decorated with edamame and bonito flakes. If you’re planning to include the entire clan, consider the lunch and dinner banquet options, such as the eight-course Overflowing Fortune Dinner menu—perfect for large groups (minimum of 10). Signature dishes include a serving of tender “ang xin” chicken and fish maw in a milky double-boiled soup. 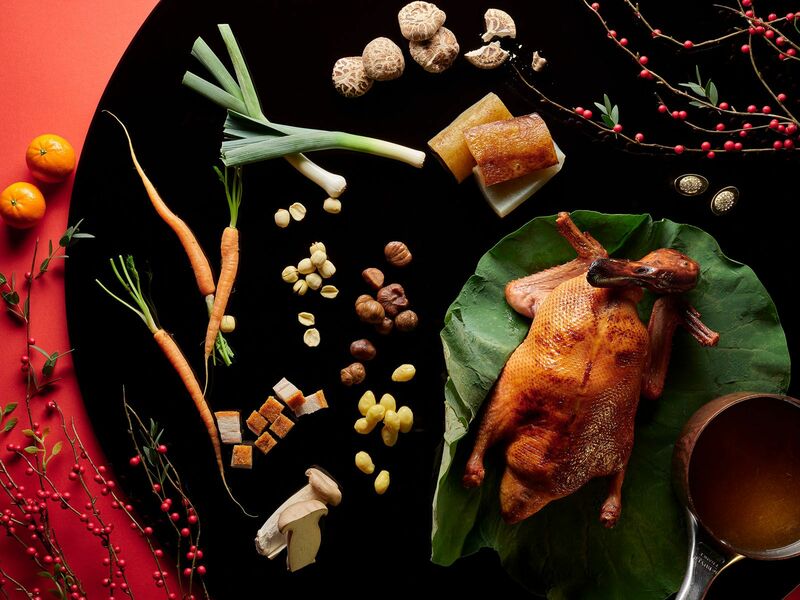 There's also aromatic claypot rice crowned with a delicious selection of waxed meats, such as chicken and lup cheong, and an invigorating bowl of chilled hashima with red dates and wolfberries to finish. What's more, these menus are available from now until February 22. It’s also important to note that these are only half of what Racines has to offer this Chinese New Year; there's no reason not to consider its feted, timeless French fare if you feel like mixing it up for a change—the daily set menus already flaunt French dishes by executive chef Jean-Charles Dubois alongside refined Chinese delicacies. For enquiries and reservations, please email HA152@sofitel.com, call the 24-hour reservations hotline 6428 5000 or visit the website. Online orders can also be placed here. Just for you: Enjoy a special 15 per cent discount on its Chinese New Year takeaways if you book before February 20 using the code TATLERCNY15.